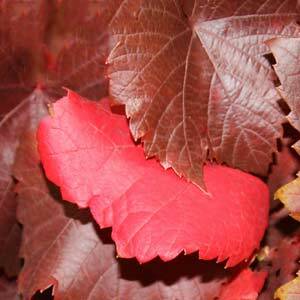 If you are looking for a climbing plant with brilliant autumn colour then the Ornamental Grape could be the one for you. Grow it over a pergola as a living shade plant, or along a fence as a screen. Perhaps let it scramble through trees and shrubs, it can provide shade in summer as well as autumn tones. The botanical name is Vitis vinifera, and it is related to the common ‘Grape Vine’. This is a variety that does not fruit. Not fruiting has its advantages in that it does not attract birds as readily, and does not drop its fruit, so less mess than the fruiting type. This is a fast growing vine that climbs using tendrils. The new foliage is mid to deep green, and as autumn comes around the foliage turns to reds and crimson creating a great ornamental backdrop. This is a vigorous climber and needs to be planted in a position where it will not out compete smaller plants. It can be allowed to climb through taller trees if desired. Plant in a humus rich soil and water through the first summer. Mulch to maintain a cool root run. Basic care requirements include using a slow release fertiliser in spring every year or two to help promote growth. Pruning to maintain size and keep it clear of other plants can be carried out as required. Foliage – Green turning red in autumn. Height – The ornamental grape can easily climb to 8 metres given something to climb on. Spread – Will spread along a fence to 8 to 10 metres. Propagation is easy from cuttings taken in spring.